An insightful, compassionate account of the grieving process thathelps us through the pain and isolation experienced with the lossof a loved one.. We're never really prepared for the loss ofsomeone we love. Thrown into a state of emotional chaos weexperience rage, guilt, anxiety, and intense sadness all at once.It's the oldest story in the world, we tell ourselves -- millionsof people have had to cope with this before -- and yet, we alwaysbelieve that what we are experiencing is unique to us. We feelisolated in our anguish and often ashamed of what we are feeling. 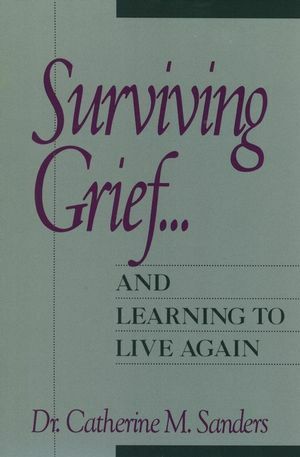 Aprofoundly compassionate and insightful book, Surviving Grief.& Learning to Live Again offers you the support andunderstanding you need to get you through this difficult time.Written by Dr. Catherine Sanders, a therapist and researcherspecializing in bereavement issues and one who has lived throughthe loss of close family members, it helps you to see that what youare feeling is part of a natural process of readjustment andrenewal. According to Dr. Sanders, grieving, like any other naturalregenerative process, must be allowed to run its proper course ifwe are ever to regain our equilibrium and continue on with ourlives. To help us better understand the process, she describes thefive universal phases of grief: Shock, Awareness of Loss,Conservation and The Need to Withdraw, Healing, and Renewal, andguides us through each. Drawing directly from her own experiencesand those of her clients and her research studies, she delvesdeeply and compassionately into the different experiences of grief,and talks about what it means to lose a mate, a parent, or a child.And she discusses the factors that can have an influence on thegrieving process, such as age, gender, and the circumstancessurrounding the loved one's death. CATHERINE M. SANDERS, PhD, is a psychologist in private practice. As an expert on grief and loss, she has conducted research, written many journal articles and has lectured extensively on the subject. She received the 1990 award for Outstanding Contribution in the Field of Death-Related Counseling from the Association for Death Education and Counseling. The Second Phase: Awareness of Loss. The Third Phase: Conservation and the Need to Withdraw. The Fourth Phase: Healing--The Turning Point. When a Child Dies--Parental Bereavement. The Death of a Spouse--Losing a Mate. On Becoming an Adult Orphan--A Parent Dies. The Power of Mourning Rituals.